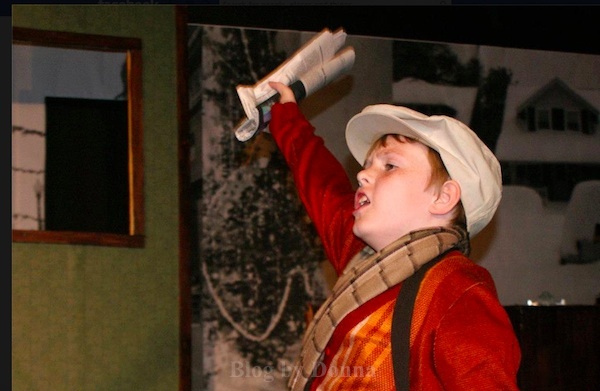 Cody is currently performing in “It’s A Wonderful Life” at Children’s Theatre of Knoxville. He is Young George, Tommy, and a Newsboy. This is his newsboy character! He plays quite a few rolls. I bet you are super excited to watch the show! That is great that he is into theatre. Very nic pic! Exciting! He’ll remember this experience forever. How cool is that? I’m sure you’re proud of him. That is so awesome! This is my favorite movie ever, he is so cute! He is adorable in his newsboy costume! Being up for so many roles is a big responsibility. It will make him more confident and more likely to be a leader later on. Remembering three roles is no small accomplishment! Impressive. Kid is going places. How exciting! I love this photo too. So cute. This is awesome, and I hope he continues to pursue acting…I always wanted to be on stage, but was never supported as a kid, so I regret it.